French workers demonstrate against the conservative government’s economic policy that would impact salaries, benefits and pensions. The strike effected the transport industry. They’re at it again, les Français. Forget le football, we all know striking is France’s national sport and today saw a fine example of the game. 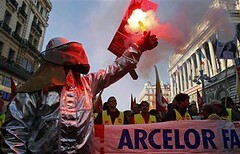 A staggering 2.5 million workers took to the streets to protest against Sarkozy’s handling of the economic crisis. Unions are demanding that he do more to protect employment, public services and le pouvoir d’achat (the buying power of the average man). Schools closed. Transport came to almost a complete halt with only 30% of trains running. And yet despite all the disruption brought by this “jeudi noir” (as the French press are calling it), public opinion is behind the strikers. People throughout France feel that President Bling, as Sarkozy is known for his love of Rolex watches, is not doing enough to help the ordinary man. They sympathize with the strikers cry of “on ne veut pas payer pour les banquiers!” (We don’t want to pay for the bankers). They agree with FO union leader Jean-Claude Mailly’s characterisation of the French government as “irrésponsable”. This isn’t your average strike, an average grève. This is revolt. To find out more about the origins of this strike see this article in Le Monde. Or if you’re after an explanation in English this article in Der Spiegel is good. Le Nouvel Observateur has an hour by hour break down of the event and videos of the days events accross France.